Ryan Joyce meets up with Michael for an epic-length discussion about social media footprints and an honest look at the benefits of a viral video. Up and comer Jen Kramer joins Michael to talk about her journey from Yale to Vegas magician, her cool USB bracelet of magic tutorials and much more. Morgan Strebler joins Michael to talk magic, comics and share some big news! Michael is joined by Max Major to explore the business of magic, including marketing and more. Check out Max’s daily vlog and more on his YouTube page (https://www.youtube.com/user/itsmaxmajor). 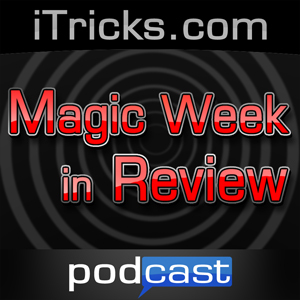 Mindreader, comic and AGT alum Eric Dittelman finally makes it to the Magic Week In Review. He and Michael discuss AGT, character, career decisions and more! Lee Asher joins Michael to talk cards, Canada, camp and more!